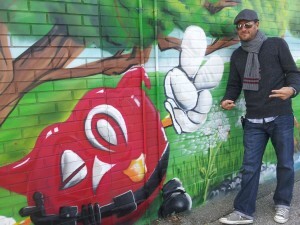 Click here for Google Plus Event with many more photos from the graffiti art mural reveal. 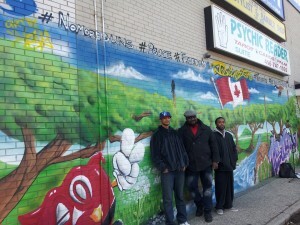 Magic Finger Wong has completed a graffiti art mural for the kids and our future at the Mac’s Convenience Store located at 2428 Islington Av, Toronto Ontario Canada (at corner of Elmhurst Av and Islington Av) before he hits the road with his graffiti art show in January 2013 in Montreal, Halifax and Quebec. 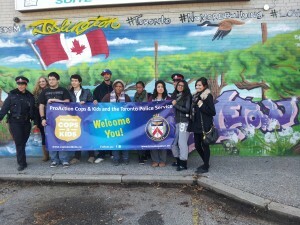 On Friday December 14, 2012 the mural, officially called “The Thistletown Mural” but unofficially known in the community as the “Islington Mural” was launched at an unveiling ceremony attended by Elmhurst Public School students, Flow 93.5FM radio show morning show hosts Melanie and JJ, Toronto Crime Stoppers, 23 Division Toronto Police Service officers and representatives from ProAction Cops & Kids and the property owners at the Mac’s Convenience Store in Rexdale. Watch the entire unveiling ceremony below. 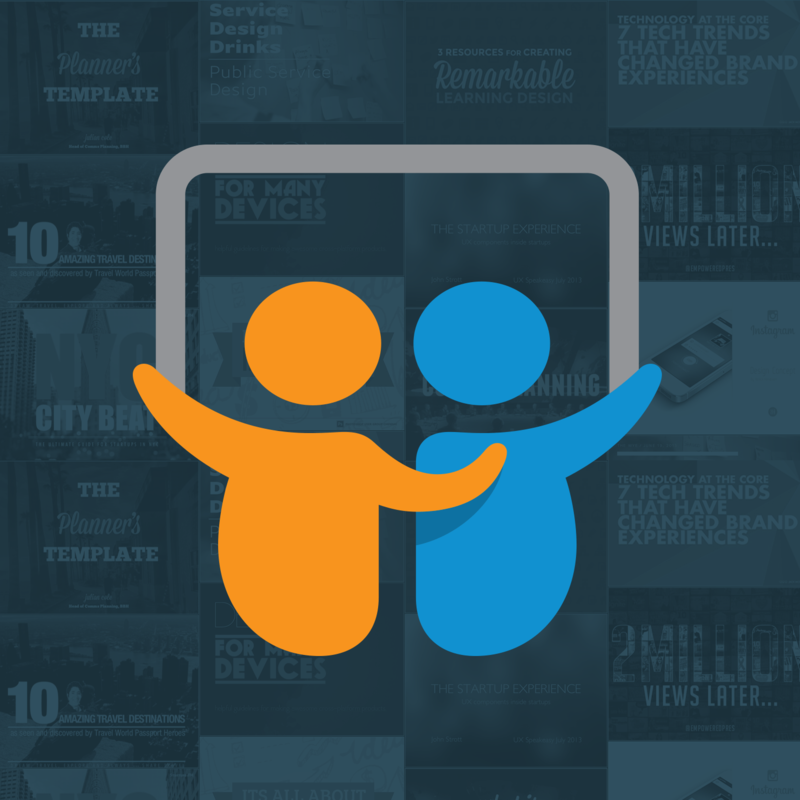 The event was live streamed using Google Plus HangoutsOnAir to Youtube. 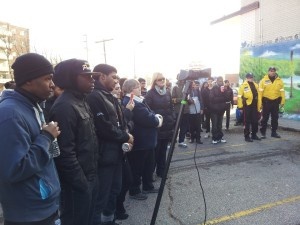 23 Division Staff Sergeant Kim Scanlan stated that she was approached by Sean about the idea and thought that it fit in very well with the Neighbourhood Toronto Anti-Violence Intervention Strategy Initiative (known in policing circles as the “TAVIS NTI” that they were involved with throughout 2012 for bridging the gap between youth and the community. 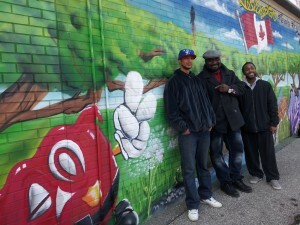 Crime Prevention officer Constable Ryan Wilmer stated “Having youth come out to see this mural at the launch today celebrates and furthers what we already had Wong engaged over the summer with Wong painting graffiti art on our police station in Rexdale. 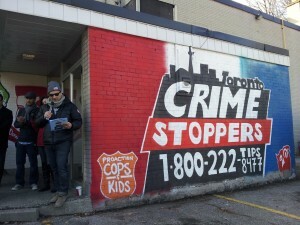 The project was funded jointly by the TAVIS NTI, Mac’s Convenience, Toronto Crime Stoppers and ProAction Cops and Kids. It takes a community to create success and safety together. Thanks Everyone! 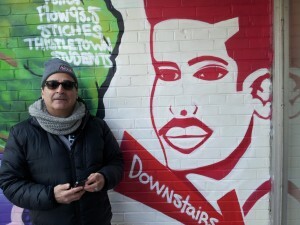 The event will be held at Mac’s in the Elmhurst Plaza, at 2428 Islington Avenue. 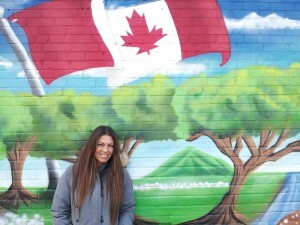 For media inquiries, please contact Lorne Simon, Toronto Crime Stoppers, at 416−560−6441.